Versatile, Full HD at 60 fps frame grabber/video capture device that doesn’t require drivers to be installed on your computer. AV.io HD is a video capture device that doesn’t require drivers to be installed on your computer—it’s as simple as using a webcam! Windows, Mac and Linux operating systems will automatically detect AV.io HD ensuring compatibility with your favorite software. AV.io HD automatically adjusts video scaling and aspect ratios based on your application’s requirements, providing you fantastic video quality — even when swapping video sources. 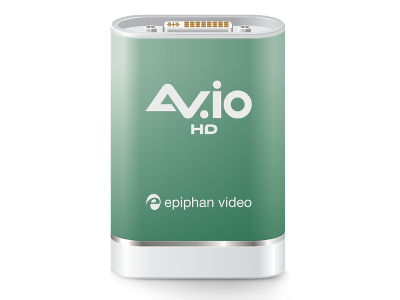 Like all Epiphan products, AV.io HD is designed to be strong, durable and rugged enough for daily use (some of their products are even used in space!). AV.io HD features robust connectors designed for reliable and repeated long-term use. Required adapters and cables for HDMI, DVI or VGA devices are included with the AV.io HD — simply connect your device and start sharing.